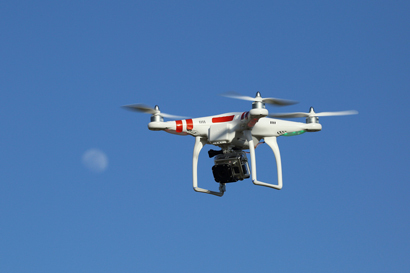 The use of unmanned aircraft systems, or “drones,” for private and commercial uses remains the subject of much debate. The issue has been heating up lately after Congress ordered the Federal Aviation Administration (FAA) to integrate UASs into the nation’s airspace system by 2015 as part of the FAA Modernization and Reform Act of 2012. The debate has thus far centered mostly around the safety and privacy-related concerns associated with private use of drones. The FAA continues to move slowly on this front based on a fear that private drones could jeopardize air safety or the safety of others on the ground. Meanwhile, some privacy advocates are worried that private drones might be used in ways that invade private spaces or even public areas where citizens have a reasonable expectation of privacy. For these and other reasons, the FAA’s current ban on private operation of drones in the nation’s airspace remains in place. But what about the speech-related implications of this debate? After all, private and commercial UASs can have many peaceful, speech-related uses. Indeed, to borrow Ithiel de Sola Pool’s term, private drones can be thought of as “technologies or freedom” that expand and enhance the ability of humans to gather and share information, thus in turn expanding the range of human knowledge and freedom. Because the airspace within a public forum should itself be considered a public forum, the government may only restrict the journalistic use of UAS technology with content-neutral regulations of the time, place, or manner of such use. Such regulations must be “justified without reference to the content of the regulated speech,” be “narrowly tailored to serve a significant government interest,” and “leave open ample alternative channels of communication.” The FAA’s blanket ban on commercial use fails to meet this test. The FAA’s ban is not a reasonable time, place, or manner restriction. This new paper by Love, Lawson, and Holton will hopefully inform future policymaking and judicial activity on this front and, if nothing else, make the FAA to realize that it is not above the law–and in this case the First Amendment–when it comes to drone policy. Please read the entire paper for more details. It is exceptionally well done and could be a real game-changer in these debates. P.S. I plan on attaching Love, Lawson, and Holton’s paper to my filing to the FAA next week in its proceeding on model aircraft regulation. The filing date for that proceeding was extended this summer and comments are now due next week. I will post my filing here shortly. The Mercatus Center filed comments with the FAA earlier about the prompt integration of drones into the nation’s airspace. You can read those comments here. You can also read Eli Dourado’s excellent Wired editorial on the matter here and here’s a video of me talking about these issues on the Stossel show a few months ago.